First impressions only come once! 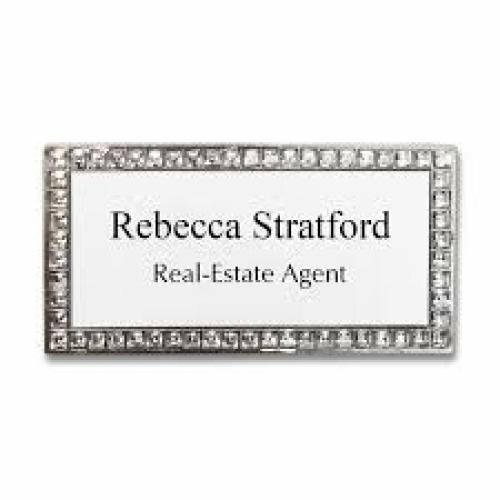 Make an immediate impact with a Custom Engraved Name Badge! 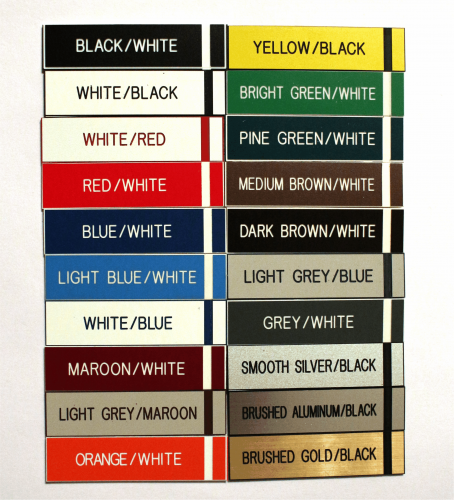 Custom evgraving and a variety of color options allow you to customize these badges to fit your company's needs. 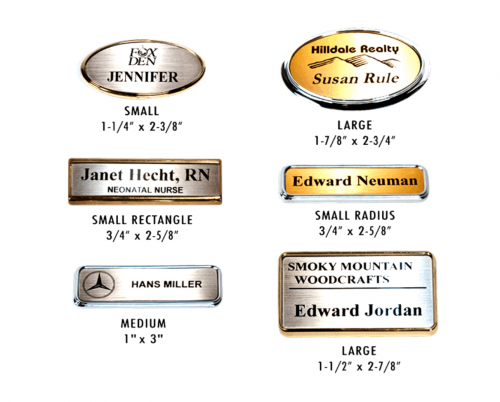 These badges come in three standard sizes or you can customize your own shape and size for an additional charge. Badges come standard with a pin back or you can substitute a swivel clip, clutch, or magnet for an additional cost. Price listings are for one line, additional lines can be added for a fee. Options for additions can be found after adding to your cart. We recommend artwork come in a black and white, vector, PDF file. If you do not have this file type we can do a artwork setup for a $25 one time fee. All future orders will not have this fee, as we will keep the artwork on file. For any questions about artwork please refer to our Artwork File Formats under Helpful Information or give us a call at 865-966-4876. 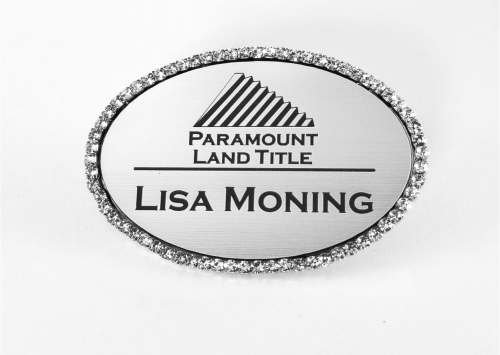 Small (1 Line) Engraved Badge 1" x 3"
Medium (2 Line) Engraved Badge 1 1/4" x 3"
Large (3 Line) Engraved Badge 1 1/2" x 3"
Custom evgraving and a variety of color options allow you to customize these badges to fit your company's needs. These badges come in a variety of sizes. Badges come standard with a magnet back or you can substitute a pin, swivel clip, or clutch for no additional cost. Price listings are for one line, additional lines can be added for a fee. Options for additions can be found after adding to your cart. We recommend artwork come in a black and white, vector, PDF file. If you do not have this file type we can do a artwork setup for a $25 one time fee. All future orders will not have this fee, as we will keep the artwork on file. For any questions about artwork, please refer to our Artwork File Formats page under Helpful Information or give us a call at 865-966-4876. *All prices are with standard magnet attachment. *Pins and other attachments are also available. Small Rectangle Frame Badge 3/4" x 2 5/8"
Small Rectangle Radius Frame Badge 3/4" x 2 5/8"
Medium Rectangle Radius Frame Badge 1" x 3"
Small Oval Frame Badge 1 1/4" x 2 3/8"
Large Oval Frame Badge 1 7/8" x 2 3/4"
Large Rectangle Radius Frame Badge 1 1/2" x 2 7/8"
Oval Rhinestone 1 1/2" x 3"
Rectangle Rhinestone 1 1/2" x 3"
Customize your own unique name badges in full color on a bright white plastic badge. 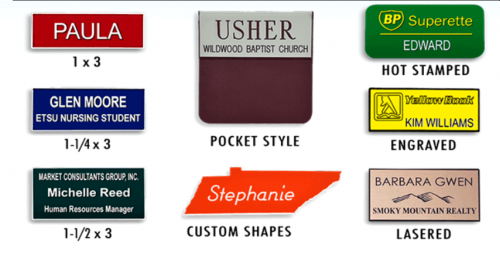 Add your logo and/or photo to make your badge one of a kind. These badges come in three standard sizes. 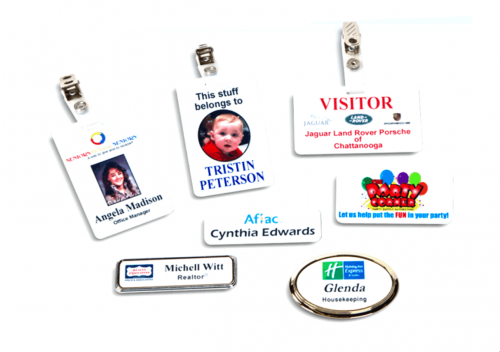 Badges come standard with a pin back or you can substitute a swivel clip, or magnet for an additional cost. You can also add a frame to enhance the appearence of your color badge. Options for additions can be found after adding to your cart. We recommend artwork come in a PDF file. If you do not have this file type, an artwork setup can be done for a $25 one time fee. All future orders will not have this fee, as we will keep the artwork on file. For any questions about artwork please refer to our Artwork File Formats page under Helpful Information or give us a call at 865-966-4876. Large Color Badge 1 1/2" x 3"
Medium Color Badge 1 1/4" x 3"
Small Color Badge 1" x 3"
Photo Badge 2 1/8" x 3 3/8"